Our multi-cyclone technology keeps the filters efficiently clean. The in-fed air is slowed down by way of rotation. Heavy dirt particles fall down and are collected in a cassette. Once the cassette is full, it is emptied via a practical click system. There is no need for manual filter cleaning and the vacuum cleaner can be used without interruption. The VC 760 comes with a very high container volume of 35 litres for private and professional applications. 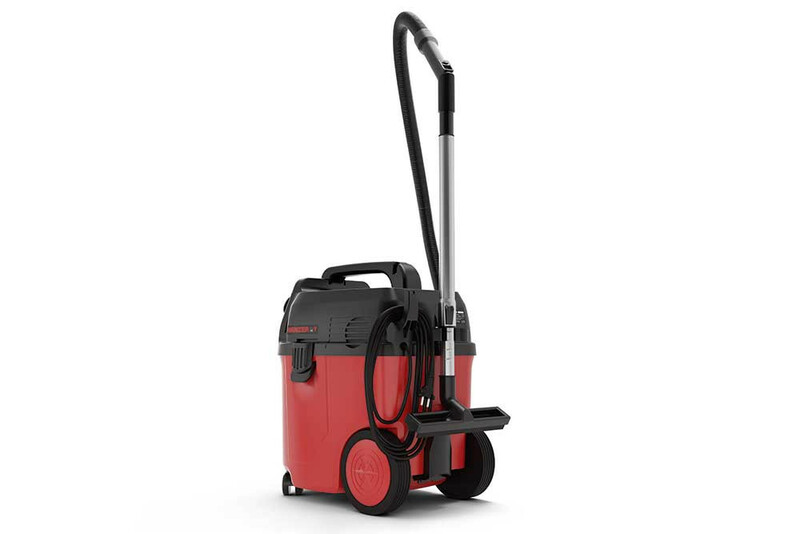 For the use as a dry vacuum cleaner and the removal of fine dust, the VC 760 comes with a re-usable fleece bag. When used as a wet vacuum cleaner, an electronic fill level monitor ensures maximised safety. Our MENZER VC 760 is fully compatible with commercially available electric tools: The machine is simply plugged in to the integrated power socket and the suction hose is connected to the tool. No more tangled cables and more safety in the workplace. An optional suction hose adapter allows the connection of third party machines. An attachment rack with three spaces for the extension tube and nozzles on the back of the VC 760 keeps everything in its place. The accessories you need most are always within easy reach. A cable retainer on the side prevents the cable tangling. The VC 760 comes with a whole host of high quality accessories. Two floor nozzles allow the dry & wet vacuuming of large areas. The circular and crevice nozzle get dirt out of corners and hard to reach spaces. All nozzles click easily onto the long suction hose or the stainless steel extension tube. A complete list of the accessories provided can be found above in the product details. Pointed nozzle for corners and edges. Nozzle for corners and smaller areas.